Drawing 4 is an alternative design for the north-west, with curving corners and a circular room fit within the irregular-shaped wing. 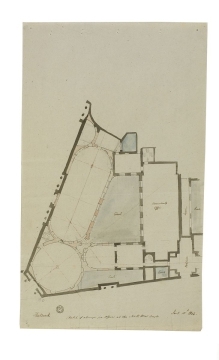 Soane had designed the north-east corner (2:7) in a similar fashion, using a plan of semicircles and curving walls to reconcile the disjointed wings and awkward angles of the screen wall. Unlike the north-east wing, however, the north-west corner had the strictly utilitarian purpose of printing bank notes under secure, well-lit, and fireproof conditions; the picturesque qualities used for the private banking offices were not necessary. Soane consulted the Bank's chief printer, Garnet Terry, for the wing's design.